I have a last-minute trip to New York this week. Because this is the season, apparently, of $750 hotel rooms when you book them late, I decided instead to save some money and make it an up-and-back trip in one day. I thought I’d remembered earlier trains, but guessed that they may have been sold out, given that I was traveling at the last minute (UX note: See how quickly I assume I’m doing something wrong, instead of the site). But this morning, as I pondered the mad 20-block dash to get to my meeting a half-hour late, it struck me as impossibly odd. 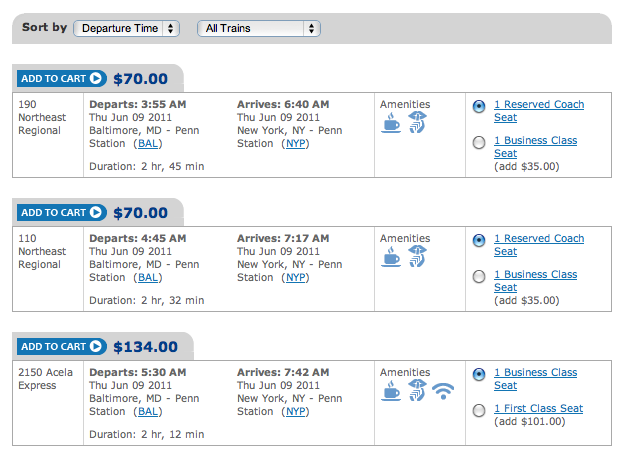 So I searched other dates into the summer, all with the same result of no trains before 6 a.m. I downloaded the official Amtrak Northeast Corridor timetable (updated March 2011) and it confirmed my suspicions: there were earlier trains. So why weren’t they showing up on the Amtrak site when I was looking, I thought, at all morning trains? I called to talk to a ticket agent. While I was on hold, I did what all flummoxed web users do: I clicked on random things. Finally, I hit on the secret combination: Instead of selecting “morning,” I should select a particular hour in the morning. 5 a.m., for example. When I finally got the friendly Amtrak web support person on the phone, I asked her why the choice of “morning” did not, in fact, display all of the morning trains. She didn’t know, but her guess (and I think she’s correct) was that the site designer assumed that most people meant 6 a.m. when they said morning. Anyway, I got what I wanted, I suppose. And now I’ll be setting the alarm for 4:30 a.m., instead of the comparatively luxurious 5:30 a.m.
Those types of UI issues are why IT folks have a bad rap. That is utterly ridiculous that it didn’t show you all the morning trains. It should also tell you the timeframe that morning means. I use Orbitz a fair bit and their “portion of the day” selections alway seem to work as desired, so it can be done right. 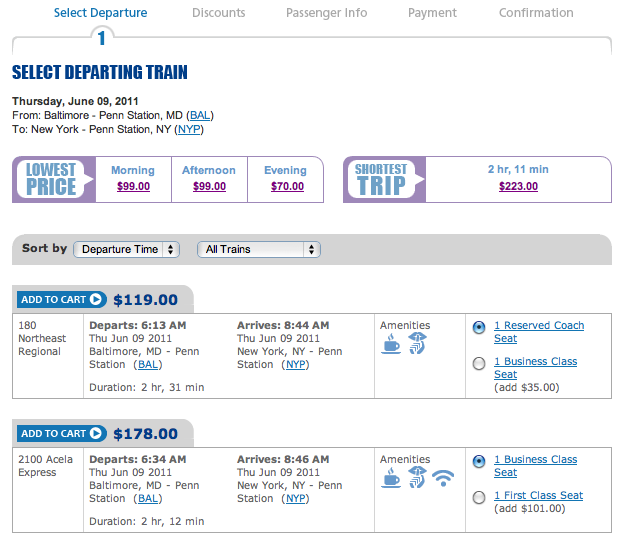 even i had issues with Amtrak site…ridiculous..